"The Fort Processor is an experimental synth and noise effects circuit created by Isn'tses as part of Fort Process sound art festival 2018. Available now as a DIY PCB or full kit." "The Fort Processor is an experimental noise synthesiser and audio effect circuit designed by harsh fun noise duo ISN’TSES (Tim Drage & Lisa McKendrick) for Fort Process sound art festival. This event takes place in the tunnels and bunkers of Newhaven Fort on the Sussex coast, and the electronics and artwork of the synth are based on the layout of the site, with inspiration from the surrounding landscape and ocean. Input: The audio input is mono. You can use either a mono patch cable from a synth, or a stereo aux cable. With a stereo input note that only the left channel will be processed through the circuit. Output: While the output signal is mono, if a stereo cable is used then the same audio will come out of both left and right channels. You can connect it to a stereo mixer/amp input using a minijack to 2x phono or 2x jacks Y-cable as appropriate. The Fort Processor is powered by a standard 9v guitar pedal power supply: 3.5mm centre negative 9v DC. Take great care never to use any other kind of power supply! There is no protection against reverse polarity, so if you accidentally plug in a centre-positive or an AC/AC power supply you will damage the circuit and at least have to replace the chips! We recommend sticking small rubber feet on the underside of the PCB, or screw it to a wood/cardboard/plastic base or box using the holes. Alternatively place it on a soft and non-conductive surface such as fabric, rubber or wood. Do not place on a metal surface. 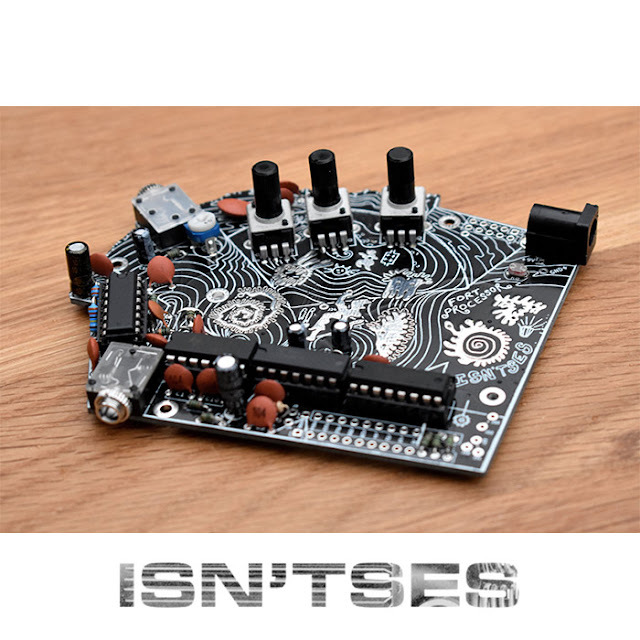 Visit http://isntses.co.uk/blog for more background and information about this circuit, including possible modifications."